An account of the unsuccessful assassination attempt of Benito Mussolini by anarchist Gino Lucetti who threw a bomb at his car in Rome on 11 September, 1926. The plot was hatched in anti-fascist Italian exile circles in the south of France. And not just by anarchists but also members of the Giustizia e Libertá groups of the Action Party and others of differing persuasions - all convinced of the need to eliminate the fascist leader physically. This gave the attempt a different context to the individualist “propaganda-by-deed” anarchist assassinations of the late 19th and early 20th centuries, such as that of Italy’s King Umberto by Gaetano Bresci or that of President McKinley by Leon Czolgosz. These propaganda by deed attacks were supposed to “inspire” the working class to rise, and in this were entirely unsuccessful. In this instance, however, the urge to kill Mussolini was the expression of a convergence of opinion among many popularly representative political groupings, and was commonly perceived as a necessity at that point in time. Though in exile, Gino Lucetti never lost contact with his comrades in Carrara and twice returned for clandestine meetings with them. Another meeting, at which the assassination was decided upon, was held in Livorno, obviously in maximum secrecy, aboard a ship at sea. Another anarchist, Mazzuchelli escorted Lucetti as far as Genoa before Lucetti went back to France to tidy up the loose ends with the comrades in exile. There he organised as best he could and upon arrival in Rome called upon the back-up of comrade Stefano Vatteroni who was working in the capital as a tinsmith. Vatteroni's role in the organising of the attack was crucial; indeed Vatteroni, capitalising upon his friendship with the secretary of Mussolini's library, a former colleague of his, supplied all the essential details right down to the route that the Duce's car would be following on 11 September. Famous Italian anarchist-communist Errico Malatesta was briefed about the plan and gave it his endorsement. Vatteroni made considerable sacrifices, albeit telling nobody on account of his typical modesty, and he even went so far as to sell a plot of land belonging to his mother in Avenza to finance what was being organised. He also saw to the question of logistical support and came to an arrangement with the Reggio anarchist Leandro Sorio, a waiter at an inn where the owner was also in cahoots with the group, so much so that he offered to put up the money to get them out of the country following the attack. Vatteroni, however, declined the offer, because the organisers had agreed among themselves that everyone was to let themselves be arrested so as to stand trial together - extreme proof of the anarchists' solidarity and determination. Gino Bibbi, another Arenza antifascist whose house the fascists wrecked and whose motorcycle they set on fire was supposedly also part of the team. He returned to Italy and Rome there to make his attempt on the Duce's life on 11 September 1926. An unsuspecting countryman of his, Lina Squassoni who lived in Aubagne near Marseilles, lent him the money for the trip. He loitered near the Porta Pia waiting for the Duce to pass by: when the famous Lancia carrying Benito Mussolini drew near, Lucetti hurled a bomb (of the SIDE type) which smashed against the windscreen. However, it failed to detonate, bounced onto the running board and only exploded when it was some metres away on the pavement. In the ensuing confusion, Lucetti sheltered in the doorway at No. 13, Via Nomentana, but the Duce's police bodyguards soon caught up with him. Kicking and punching him, they found him in possession of a second bomb of the same make, a handgun with six dumdum bullets poisoned with muriatic acid, and a dagger (he had certainly come prepared!). At police headquarters, under ferocious questioning, he let it be known that his name was Ermete Giovanni, from Castelnuovo Garfagnana. On account of this phoney story, he led the regime on a merry dance, as a result of which their enquiries focused solely upon uncovering the leaders of the conspiracy of which he was allegedly part, in Garfagnana and nowhere else! Roadblocks were thrown up and dozens of people arrested: when Lucetti at last gave his true particulars the whole investigation was shown up as ridiculous. After his trial in 1927, he was sentenced to 30 years' imprisonment. Two others, held to have been his accomplices, Leandro Sorio and Stefano Vatteroni were sentenced to 20 years and 19 years 9 months respectively. Vatteroni served the first three years of his time in complete isolation and the only company allowed him was that of a sparrow which visited his cell. 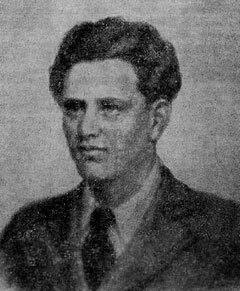 Lucetti was lodged in the Santo Stefano prison where he spent nearly 17 years before being moved to Ischia where he died on 15 September 1943.